Go ahead, admit it: you’ve always wanted to learn how to play an instrument. Maybe you tried the piano when you were a kid, but it was too hard. Maybe you received a guitar for Christmas one year, but it just collected dust in your closet. Introducing: the ukulele! This low-key instrument is a great "gateway" instrument to begin your journey with musical adventure. In recent years, libraries everywhere have begun expanding their collections to include non-traditional items for checkout by users, including everything from musical instruments to gardening tools. Here at the Los Angeles Public Library, you can check out electricity meters, wi-fi hotspots, and our LA Plays! toy kits, and soon you’ll be able to borrow a ukulele with your library card and take a beginners class at several locations. The ukulele is a curious instrument with an interesting history and seems to drift into and out of popular culture every so often. The popular version of the "uke" story begins when it was introduced to the Hawaiian islands by Portuguese immigrants from the Madeira and Azores Islands. Indeed, uke celebrities like singer Israel “Iz” Kamakawiwo’ole and virtuoso Jake Shimabukuro further associated the instrument with its Hawaiian origins. These little instruments have once again come into popularity in recent years, because of their affordability, their accessibility for new learners, especially children, their portability, and their laid-back fun nature. Popular musicians like pop megastar Taylor Swift, rocker Eddie Vedder, teenage sensation Grace Vanderwaal, and hip new bands like Beirut have all proudly featured their ukes. In fact, ukulele culture is massive, especially online; YouTube features literally thousands of videos of tutorials and amateur uke enthusiasts offering versions of their favorite songs. With the vast amount of resources for the novice and the expert alike, it’s never been easier for the beginner to get started. But why should we care about the arts, or music in particular? The short answer is because statistics have shown that access to music education has a positive effect on academic performance, graduation rates, and even self-esteem. According to a recent Gallup poll, 95% of Americans consider music to be part of “a well-rounded education.” This project began in 2016 as a pilot program with a small grant, in an effort to help counteract the loss of music education programs at local schools; the Wilmington Branch Library became the first Los Angeles Public Library location to offer circulating instruments as well as a series of beginning youth classes. 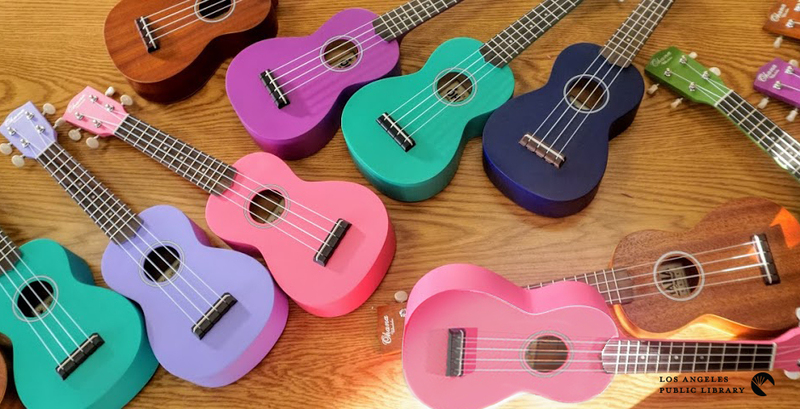 This spring, you’ll be able to borrow ukuleles with your library card, and attend classes and workshops at 16 other locations throughout the library system. In keeping with the Los Angeles Public Library mission to provide “free & easy access to information, ideas, books and technology that enrich, educate & empower” everyone in our communities, this program offers library users a chance to explore music education for free with their library cards. Look for beginners’ workshops and three-week classes happening at a library near you, taught by our panel of local uke experts, this spring! See Uke at the Library! Mike Gregan leads the community ukulele group Mele ‘Ohana. He is a lifelong musician who has studied ukulele instruction in James Hill’s Ukulele In The Classroom program. Mike has taught ukulele since 2010 at Barnsdall Art Center in Hollywood. Heidi has been playing ukulele since she was five and enjoys sharing music with all ages with her group, The Sukey Jump Band. After many years working as an actor, she now travels the world teaching and performing ukulele with her partner Daniel Ward. Daniel is an accomplished musician, performer, composer and teacher, who has traveled the world playing flamenco guitar with Ottmar Liebert & Luna Negra, and travels extensively playing and performing ukulele with his partner Heidi Swedberg. He is also a columnist for Ukulele Magazine and other ukulele websites. Celia Lawley is a graduate of the USC School of Music, and is a singing, clogging, fiddler, songwriter, and multi-instrumentalist. She has performed extensively, featuring guitar, fiddle, mandolin and piano, playing every kind of music from Celtic to Cajun, country to Latin jazz.